I can’t begin to tell you how much I love that I have continued to have new requests to deliver cookies to this day. I have tried to get my feet firmly planted but have found that unfortunately, having a career, a family, and so much more, time and desire have not found a way to meet in the middle. I am the type of person that if I can’t do a good great job, I don’t want to do it at all. I want to give 110% and achieve results that come with that level of effort. For those who are new(er) here, this started as a one time event for the month of December 2014 that all came together in just under 3 week’s time, bringing over 30,000 cookies to over 15,000 law enforcement officers (and support) in 24 states. It was fast, it was fun, and it was so needed for our LEOs and for ourselves. I did not know at that moment that I’d want to try and continue but my desire to continue to help people send appreciation (with the backing of thousands) quickly led me to the desire to push on. Having the struggle of time and energy however, has left me with unanswered requests and unanswered desire from so many great people wanting to participate. I don’t like that I’ve been that person who has not replied. Adding to this was the struggle of whether or not too keep this going. As many of you know; some do not, edibles has been and continues to be a great concern for me. At this point, I have been continuing to post on Facebook to keep alive what we have in the hopes of doing (at the very least) an annual event. Sharing something on Facebook does not entail the same level of time and organization that a large cookie campaign does so that aspect has come easy. I know enough officers to know that they are very particular about what they consume so I have no doubt that same level of awareness will continue. If you are family to a LEO and want to join us, please speak to the department and make sure they are okay with such an act of appreciation. Since I don’t have the time (currently) to screen and approve (this pains me), if you’d like to participate, please feel free to create your own banner / sign / tags and share your photos and stories with us. 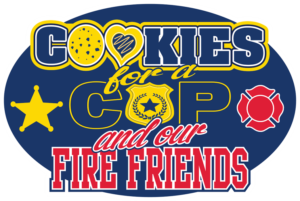 Let your department know that you are joining the vision that Cookies for a Cop brings and share our Facebook page so they can follow along if they’d like. While your contribution won’t be on the December stat page, the mission to appreciate and uplift will be completed. Then, you can come back later when we announce a campaign and apply to “officially” handle your local department(s). NOTE: Only official tags will be created for actual campaigns (large drops across the country at the same time). We will definitely do one campaign per year so please stick around and help with those events for your local department, if possible. I will recruit help during this time to make sure we have a solid team that is able to reply to emails and coordinate so we can grow this beyond compare. At this time, if you have questions, comments, or anything else, please feel free to reach out via the Facebook Message option on the Cookies for a Cop page. Should you wish to share stories, news articles, pictures, or even things going on within your department that you’d love to get a shout out for, please share on our page or via the message option. We’d love to have YOU involved in what’s going on here. This page is about you, your loved ones and those who protect us daily. I appreciate your support for this page and this effort over the past few months and hope that you continue to help spread #sweetkindness. Let’s kick off Cookies for a Cop 2017! During a time of much tension and in seeing, first hand, the tremendous stress put on our local officers, it was decided that something needed to be done to lift their spirits. The thought of “I should bake” went on to “maybe some friends would like to help” and ultimately, now, to hundreds of people around the country wanting to take a moment to offer a sweet thank you to their local law enforcement officers. Our journey will not end here. We are just getting started! ALL of this is brought to you by people in your community who care. This is not the work of just one person but of the coming together of so many. Our mission here is simple. We want to encourage everyone to spread kindness without the worry of a huge investment in time or money. Whether you buy or bake, the gift of a cookie is one that will always bring a smile. When facing times that are filled with so much uncertainty, a small act of kindness can change the playing field for all. Love and compassion are contagious. Lead the way. Inspire others.